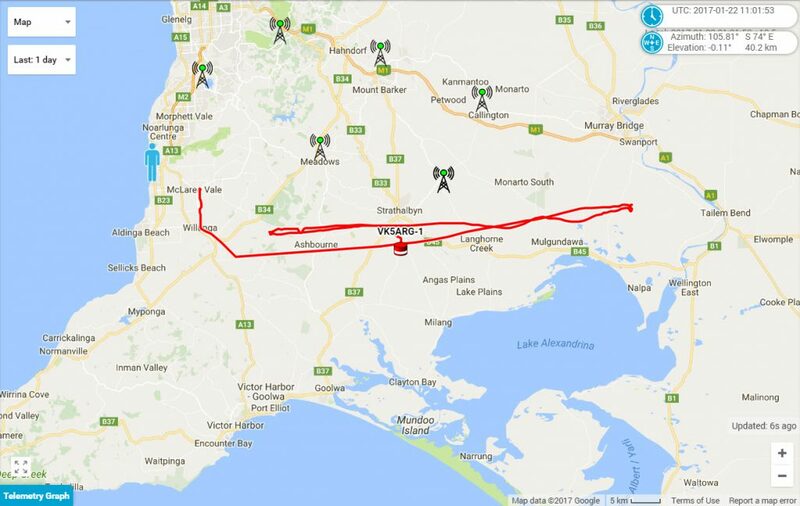 Part of the program comprises a simulated satellite launch campaign using a high altitude helium balloon platform, flown using the resources of the Amateur Radio Experimenters Group and Project Horus, which are based here in Adelaide. 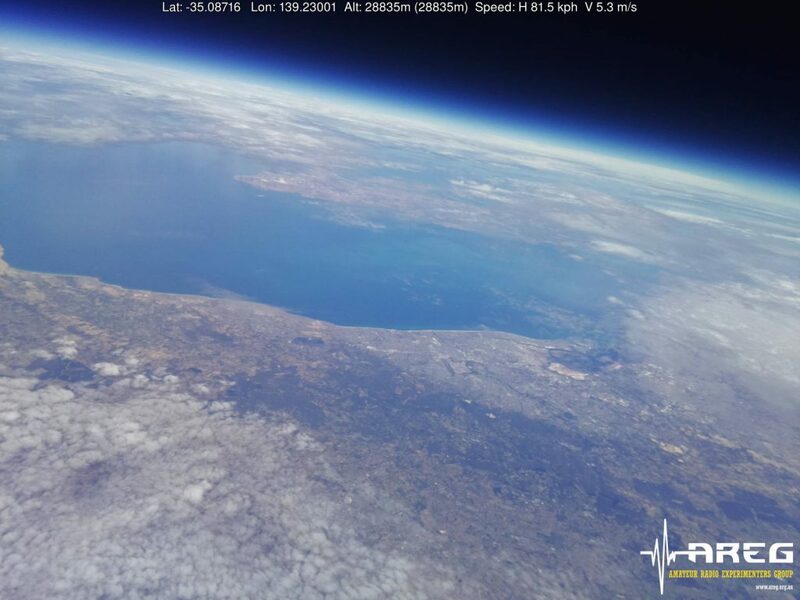 This in fact marks the 7th year of the group’s High Altitude Balloon Project, which was the brainchild of Terry Baume VK5VZI. Like many of the Horus launches, this one again sought to strengthen ties with programs that are related to Science, Technology, Engineering and Maths (STEM) in education. Bringing Amateur Radio into context with space studies and education helps highlight the huge diversity of the Amateur Radio service and it’s absolutely unique place in the Australian technology landscape. No other radio-communications service provides an opportunity for interested persons from a huge diversity of backgrounds to come together and undertake cutting edge explorations into communications technology. The project this year was set some very ambitious goals. Built on the success of last year’s flight, and the newly designed high speed transmission link capability designed by Mark VK5QI, with help from David VK5DGR and Bill VK5DSP, the plan this year was to send aloft two balloons simultaneously, carrying look down cameras observing in both the visible and near infrared spectrum. The aim was to conduct investigations into water resources through remote sensing imagery. These payloads were to downlink their data in real time over the Wenet 115kbit/s telemetry links. A third Wenet payload with an outward looking camera was also flown. The students were then mentored through the construction of the second Wenet payload by Mark VK5QI and Matt VK5ZM. They were also given training in flight prediction, launch and recovery procedures by Matt and Grant VK5GR and were given opportunities to be involved in every aspect of the flights. Ultimate launch control, tracking and recovery was then the responsibility of the AREG team, with over 20 members involved in some aspect of the flight, as well as many more amateur radio operators across South Australia who all contributed to receiving telemetry information from the balloon, which helped with the payload recovery efforts. The day began early, with the AREG and University teams arriving at Serafino’s Winery in the picturesque McLaren Vale region at 8.00am. The first order of business was to unpack the balloon filling station, and then setup the Wenet SSDV receive ground station, which was to be used later in the day to capture the 115kbit telemetry from Horus 41 and relay it into the publicity event at the winery. Horus 41 ground was to be manned by Paul VK5BX and Bill VK5DSP (from UniSA), with much of the equipment supplied by Matt VK5ZM. Matt and Chris VK5CP were also heavily involved in the publicity engine throughout the day, with Matt again proving adept as master of ceremonies during the launch, describing to the spectators what was happening and the overall process of getting the balloon in the air. He also played a major role in the formal part of the SHSSP program, giving a formal 10 minute presentation on the AREG, Project Horus and Amateur Radio to 100+ guests and VIPs invited to attend the launch. The payloads were then laid out in order and the balloon train was prepared, with students helping the AREG team along the way. Some extra payload was added in the form of Serafino wine grape seeds, which will subsequently be planted to see if exposure to high altitude changes their character at all many years down the track. Next, balloon filling got underway and the ISU student team set about helping Grant VK5GR, Andrew VK5XFG, Josh VK5JO and Sharon VK5FSAW getting the balloon filled and readied for launch. Horus 41 was to use a Totex balloon and was carrying approximately 1.2kg in payload weight. The count down began and everyone kept an eye on the time, knowing that the team in Mt Barker were doing the same thing. We aimed to lift off at 10:00am, but due to some difficulties with the balloon filling equipment, this was delayed slightly. The count down went on hold while this was rectified, and then we resumed. By 10:02am everything was ready, and launch release was placed into Matt VK5ZM’s hands. 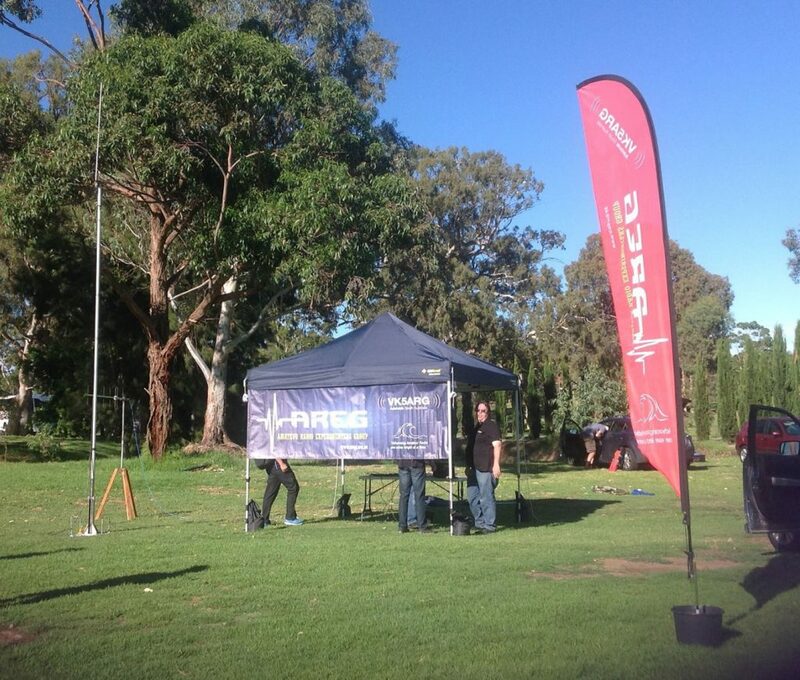 Contact was then made with Launch Team 2 up in Mt Barker to confirm how their preparations had run. The Mt Barker launch was a more low key affair, with just the ISU students and the AREG launch team. Mark VK5QI lead operations at Mt Barker, helped by Kim VK5FJ, Dennis VK5FDEN, Anthony VK5AHV, David VK5DGR, Andrew VK5AKH and Gary VK5FGRY. Horus 42 was using a larger Hwoyee Balloon as the flight path was predicted to encounter fewer obstacles. An unseen to the public but vitally important part of the exercise was the work being undertaken by Peter VK5KX and Scott VK5TST to provide a primary ground station for collecting the Wenet imagery. Peter found himself a suitable location on the SE edge of the Mt Lofty ranges and setup the communications bus. It served two purposes, with the first being the telemetry reception and internet uplink, but the second was also recovery team liaison on VHF amateur radio (2m). Repeater coverage in the landing zone was very poor, so simplex relays were used to maintain team communications. Finally at 23:45UTC (10:15am) both Horus 41 and Horus 42 made it into the air. At the last minute, the ground winds sprung up at Mt Barker, causing some consternation. The launch was held for 2 minutes while the team waited for the winds to abate, and then we took to the skies. Telemetry started to stream in as the balloons gained height and more distant stations could receive the signals. Images were being received too and all looked good for two successful flights. Shortly after lift off, however, the first wrinkle appeared in our plans. High Altitude Ballooning is never an exact science, and today wasnt going to be an exception. It turned out Horus 41 wasnt climbing as fast as intended and the low altitude winds were pushing it further south than planned. This was bad news, as it greatly increased the risk of a landing in Lake Alexandrina (and the consequential loss of the payloads) instead of on the open plain to the north of it. An anxious hour followed where the predictor was watched very closely, tracking height, and the actual landing zone if the flight was stopped at any particular moment. Fortunately the track drifted north and we started to breath easier, once we passed 31km altitude and had removed the lake from the landing equation. This was also one of the most complicated flight campaigns AREG and Project Horus has undertaken. All up we had 2x LoRA transmitters, 2x RTTY transmitters and 3x 115Kbit Wenet transmitters on air on 70cm at the same time! This spectrum display shows how we were spread out across the Amateur 430-450MHz band – where we had to borrow space from the ATV and repeater link segments to accommodate everything. This puts the amount of work into perspective in constructing and operating all of these facilities. The AREG and SHSSP thank you all for your interest in the project and your contributions to the tracking and telemetry effort. A special thank you too to Phil Heron MI0VIM who was in Australia this week and flew across to Adelaide especially for this event. For those who didn’t realize, Phil is one of the creators of the HabHub system that the UK High Altitude Society built that is used by Project Horus to support our flights. And then the Images Flooded In….. The recovery of Horus 41 was very easy (for a change) with the payload landing on a service track that we could easily get to within 100m by car. Touchdown was ~1km from the tracking team, although we weren’t lucky enough to catch a glimpse of it in the air. After the land-owners were approached, access to retrieve the payloads was obtained. Three of the SHSSP students plus the AREG Horus 41 tracking crew collected the payloads, and then as a surprise for the organizers were able to deliver them back to the launch venue and present them to the VIPs prior to the conclusion of their event. Horus 42’s flight recovery was also successful, although it did come close to landing on a major road! In the case of Horus 42, they were there to see the landing live! No small achievement (only about 1 in 5 flights are we there at the exact landing site). All told, the day was considered a complete success. 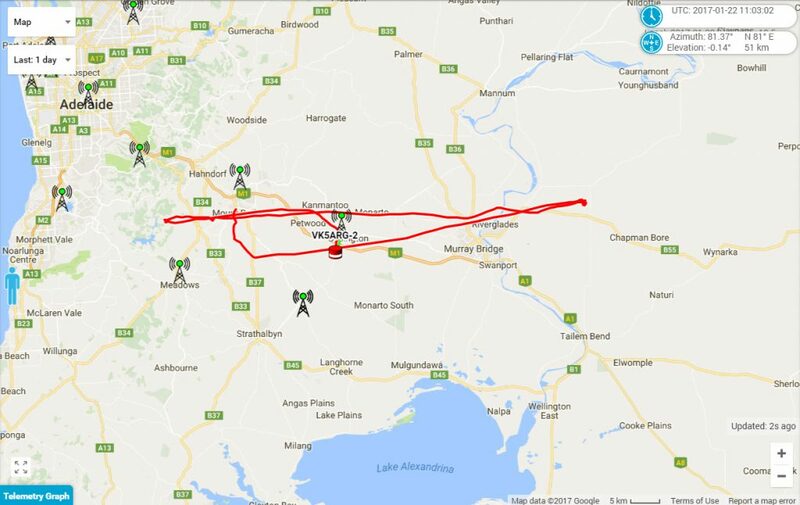 Both balloons achieved greater than 30km altitude, the images were successfully collected over the air on the Wenet network and 23 separate amateur stations across South Australia were involved in collecting tracking information. The goals of Project Horus’s engagement with the Southern Hemisphere Space Studies Program in bringing Amateur Radio into education were met and then some! It was fantastic again working with the crew at the University of South Australia, and we hope that AREG is again invited back next year! Stay tuned for a further blog post this week with some video animations of the tracking and some film clips of the launch and landing activities too! More to follow….. This entry was posted in Horus, Project Horus, SSDV and tagged hab, Horus, SHSSP 2017 by VK5GR. Bookmark the permalink.